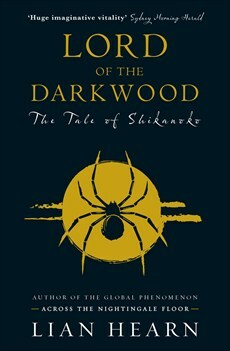 Lord of the Darkwood is the conclusion to the mythological prequel series of Lian Hearn’s bestselling Otori books. As with the previous volume Emperor of the Eight Islands (reviewed here), Lord of the Darkwood is actually a compilation of two shorter books the first called Lord of the Darkwood and the second and final volume called The Tengu’s Game of Go. This again is to the benefit of the overall tale as the first volume of the two is practically all set up for the concluding part. In fact the titular character, Shikanoko, hardly makes an appearance in the first volume and then only in the distance of another character’s point of view chapter. Actually, as the plot progresses it appears that the second title is probably more apt for the whole series. Much like the gods in Terry Pratchett’s early Discworld novels, the story seems to boil down to a game played by superior beings. Some characters actually get a glimpse of the Tengu, or spirits, playing a game of Go with their lives on the board. So that what seems to them like free will often turns out to be either direct manipulation by forces well beyond their understanding or being blown by the wind of a predetermined fate. The pleasure in reading this type of mythology is not in trying to second guess the ending. Much like most mythology (even of the modern style like Star Wars) readers know from the beginning where this is going. The pleasure is in following the way the story plays out, the good guys, the bad guys, those on the edge who can be swayed one way or the other. And Hearn manages this story-telling style well. Despite a large cast of characters and a very formal style she manages to create a believable fantasy realm populated with people the reader can cheer for or rail against. And while the overall form of the tale is set, the fates of individuals are not so clear cut. There is still some disconnect between Hearn’s style and the Japanese source material that she draws on. But while she acknowledges this material, the reader is aware that this is not actually Japanese mythology. Instead, this is the Japanese-inspired world of the Otori, a world that Hearn knows intimately and has been able once again to successfully deepen with this mythological prequel.